February 06, 2017, New Delhi, Shriram Automall India Limited (SAMIL), India’s Largest Service Provider for Exchange of Pre-owned Vehicles & Equipment, will inaugurate its 65th Fantastic Automall facility in Coimbatore. The Automall is the 5th facility in the Tamil Nadu State and is in line with the aggressive expansion plans of the company. Spread across a sprawling 9.9 acres of land the Automall will aim to satisfy the demand of pre-owned vehicles and equipment through an organized medium. Coimbatore is also called the "Manchester of South India" due to its extensive textile industry, fed by the surrounding cotton fields and will receive good demand for farm equipment & commercial vehicles. The Automall is strategically located at Palankarai Village on Perundurai Road, Avinashi. People from all across Coimbatore and nearby locations like Mettupalayam, Pollachi, Tirupur, Erode & Salem can come to the Automall and participate in our bidding events. Tamil Nadu is a state that receives major demand of pre-owned vehicles and equipment and Shriram Automall through its constant efforts aims to satisfy the ever growing demand by inaugurating more Automalls in the state. Farm equipment and light commercial vehicles form the majority of demand and SAMIL through its agreements with leading banks and NBFCs will offer the most extensive line up of all segments including commercial vehicles, construction equipment, agricultural equipment, passenger vehicle, two wheeler and three wheelers. You are invited to be a part of the grand inauguration ceremony on 06th February 2017, 10:00 am onwards. Take part in our most exciting bidding event and buy the used vehicle you desire in the most transparent and organized manner. 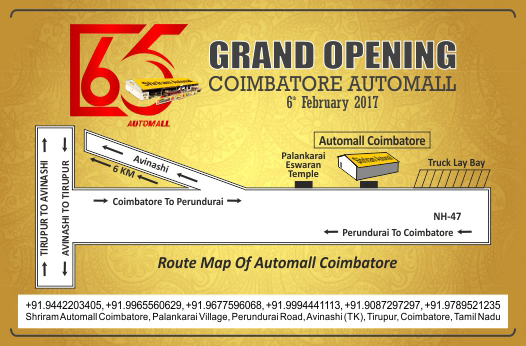 As a part of our expansion plan to inaugurate 75 well structured Automalls by 2020, with the launch of Coimbatore Automall, which is the 65th facility of the company we aim to reach the number before the target set. With favorable demand of used vehicles and equipment across the country along with a positive outlook for the coming years we are hopeful of achieving this new target easily. Our organized & transparent process has been accepted very well by the customers and we are all set to strengthen their trust through this Automall. 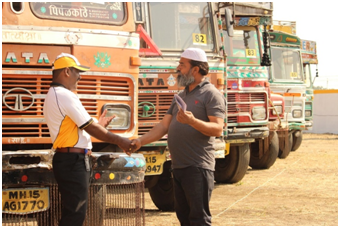 Shriram Automall being India’s most trusted service provider for exchange of used vehicles & equipment generally attracts a number of customers at all its bidding events across the country. The company have over 6,00,000+ unique bidders who like to visit the Automall for all their vehicle & equipment need. Being a transporter I visit Shriram Automall on a regular basis. I use their professional service to the fullest as I dispose my used trucks here and at the same time get the finance facility on the trucks that I buy again. It’s totally OneStop solution for everyone’s need. I recommend SAMIL whenever someone asks me about a place for buying used vehicles. Like them Shriram Automall has furnished the requirements of more then 3, 50,000 customers who now only trust SAMIL for their used vehicle needs. Its transparent & organized process has been accepted very well in the country and with Automall near their reach it has truly transformed the pre-owned vehicle market. Shriram Automall India Limited (SAMIL) India’s Most Trusted Platform for Buying & selling of Used Vehicles & Equipment in association with CLAAS Agricultural Machinery Pvt. Ltd will be conducting second bidding event in a raw at their Salem Automall. 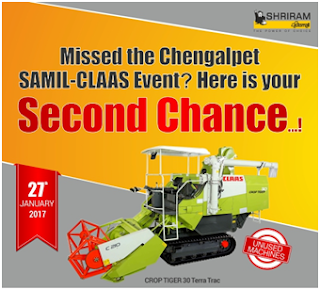 The event will be a one of a kind bidding event where unused inventory of CLAAS CROP TIGER 30 Terra Trac Machines will be disposed at a never seen before price. The event will feature disposal of 10+ used harvesters through SAMIL’s most transparent & organized physical bidding platform. Customers from Salem & nearby locations can take benefit and participate in this exclusive event which features world class harvesters that can multiply the harvesting efficiency for your farm. Bidding event will be conducted at Shriram Automall Salem: Shriram Automall Salem, Puthur Itteri Road, Nethimedu, Salem, TamilNadu which is expected to receive a mass footfall as a result of extensive marketing & promotion activities conducted by the company. 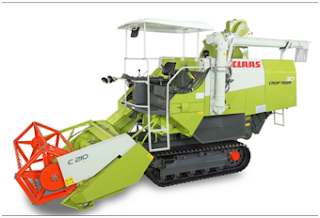 Since its launch in India the machine has revolutionized mechanized rice harvesting, this compact and light combine harvester equipped with reliable rubber tracks is ideal for rice paddies. As well as making harvesting quick and easy, the CROP TIGER 30 TERRA TRAC delivers excellent grain quality and negligible losses. Customers are free to inspect the machines two days before the event at the above mentioned address to make their choice. The event will began at 10:00 am and customers can participate in it by paying a Refundable Security Deposit (RSD) amount of Rs. 20,000 through a Demand Draft. Vehicular pollution has always been one of the major concerns of Indian Government & to combat that various state government has introduced a number of initiatives, most popular being the ‘Odd & Even Scheme by Delhi Government. Later the government informed the automobile industry that it needs to upgrade their vehicles to BH VI compliant engines by the year 2020. With its aim to contribute its part the Automotive Research Association of India starts on road emission testing in Pune to collate data about tail-pipe emissions. 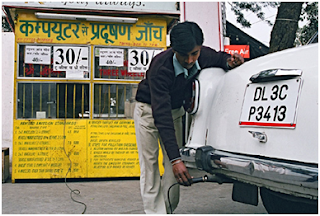 Currently only lab based testing is compulsory in India however the on-road testing will be compulsory in India too by 2023, three years after the implementation of Bharat Stage-VI regime on April 1, 2020.
roads. This will be done in a mix and match manner,” Rashmi Urdhwareshe, director, ARAI, said. Buying a vehicle is getting easy day by day and with coming of organized platform dedicated to this industry people are putting good amount of trust and are inclined towards buying a used car of their preference. Today we bring you a major point that people forgets to do while transferring the name of vehicle owner. Congratulations! You bought a used car of your choice, the first thing that you are expected to do now is to get the owner name transferred and be a legal owner as well. But wait! 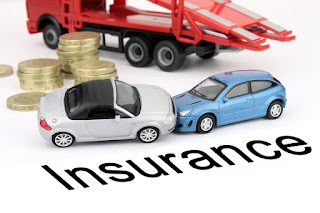 If you bought a car that already has a valid insurance policy running it’s important to also get the policy transferred as well to seek reimbursement in case of repairing accidental damages. On January 10, consumer court bench dismissed a complaint by Pimple Gurav resident Vasant Gaikwad, who alleged deficiency in service on the part of Bajaj Allianz General Insurance Company for rejecting his claim of Rs 1.43 lakh against repairs of his car on “flimsy grounds”. Court ruled out his plea to claim the reimbursement amount irrespective of the fact that the policy was in the name of its previous owner. The court relied on a 2014 ruling by the National Consumer Disputes Redressal Commission in a case of Section 157 of the MV Act not complied with. “The complainant has failed to transfer the insurance policy in his name. Hence, he cannot take the benefit of insurance policy which was obtained by the previous owner. Shriram Automall India Most Trusted Platform for Buying & Selling of used vehicles & equipment makes sure to educate its customer on such instances as we believe that the customer should be protected against all odds be it in terms of insurance or for choosing a transparent platform for buying used vehicles in India. Bidding event will be conducted at Shriram Automall Chennai, Vill Pukkathurai, Kuttu Road, Dist Kanchipuram, Padalam, Chengalpet, TamilNadu which is expected to receive a mass footfall as a result of extensive marketing & promotion activities conducted by the company. Since its launch in India the machine has revolutionized mechanized rice harvesting, this compact and light combine harvester equipped with reliable rubber tracks is ideal for rice paddies. As well as making harvesting quick and easy, the CROP TIGER 30 TERRATRAC delivers excellent grain quality and negligible losses. Shriram Automall India Limited (SAMIL) India’s leading service provider for exchange of used vehicles & equipment will be inaugurating its 64th Automall facility in Saharanpur, Uttar Pradesh on 19th January 2017. The Automall will be SAMIL’s 19th facility in the north zone and will aim to satisfy the demand of pre-owned vehicles and equipment through an organized medium. The Automall is strategically located just 300 meters away from the main sharanpur road and spread over a sprawling 1 acres of land. People from all across Saharanpur and nearby locations like Deoband, Rohana & Nagal can come to the Automall and participate in our bidding events. You are invited to be a part of the grand inauguration ceremony on 10th January 2017, 10:00 am onwards. Take part in our most exciting bidding event and buy the used vehicle you desire in the most transparent and organized manner. 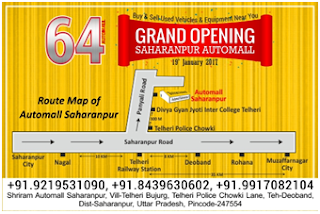 As a part of our expansion plan to inaugurate 75 well structured Automalls by 2020, with the launch of Saharanpur Automall, which is the 64th facility of the company we aim to reach the number before the target set. With favorable demand of used vehicles and equipment across the country along with a positive outlook for the coming years we are hopeful of achieving this new target easily. Our organized & transparent process has been accepted very well by the customers and we are all set to strengthen their trust through this Automall. Electricity & Hydrogen are the fuels of the future and the whole world is moving towards them, today we bring you the comparison on which fuel vehicle will serve better purpose. Tires are one of the most important units of your car, truck or tractor and it becomes very important for every driver to know, how to rotate the tires, therefore here we provide you with effective tips about rotating the Tires. 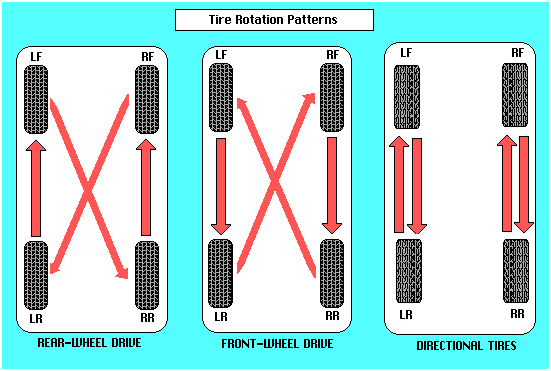 The knowledge for rotating the tires is a good skill to have. 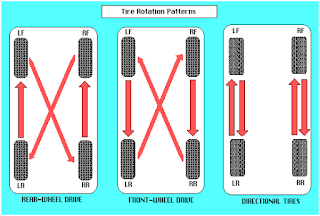 Rotating the tires is important because all the tires wear differently depending on their position on your automobile. By rotating your tires, you can make them last much longer and save some money for yourself. Before you begin lifting your car, make sure that you are on the flat, level surface and have engaged the parking brake. You can place blocks of bricks at the back the tire which will be on the ground surface. Prior to raising the car, loosen the lug nuts by using a torque wrench so that it is easier to take off once the car is off the ground. Use your car jack to raise the car and place the jack stand under the tire and lower down the car. Be careful and do not go under the car. Take your time to decide which side to lift up first. It is possible that you might have to lift and lower the car multiple times. Once you have rotated the tires, you should ensure that the lug nuts are screwed back onto the tire properly. Lug nuts will stay in the same location on the car rather than with the same tire. Put them back using the start process. This means once you tighten one nut, tighten the one across from it, & continue the pattern. Lower the car back to the ground & remove the jack after lowering it. Learning to rotate the tires will save you a lot of money as well as increase the life of the tires. After you have learnt to change, it will not take you more than 20 min to change the tire. Once you are well versed with changing the tires, you can use it to change tires when they get flat. 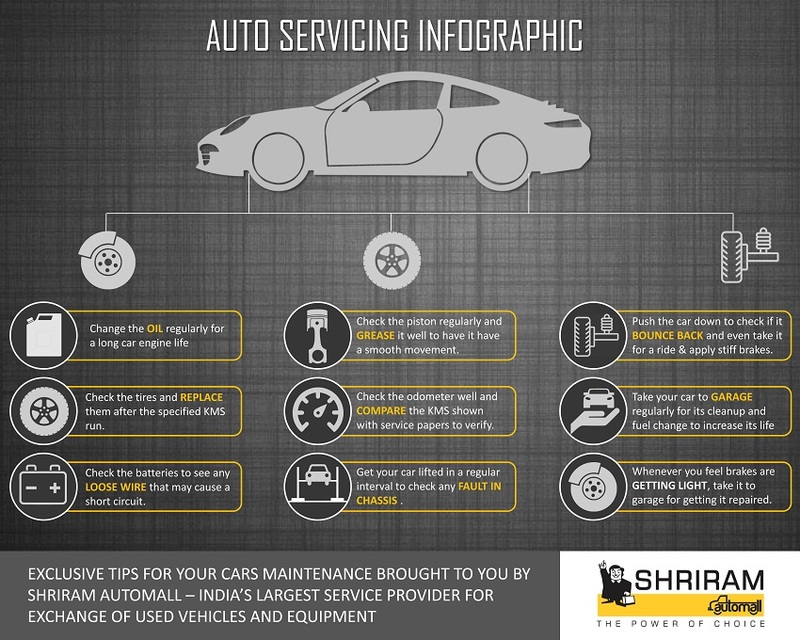 Here are some of the effective tips to take care of your car. 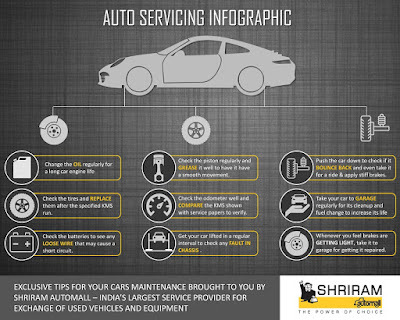 Follow these tips for increasing the life of your car. There is no denying to the fact that the used car market has shown striking growth, we can see a rapid change in the thinking of people, who were first hesitant to buy used car now considers it as an option to upgrade their choice. The ratio between both new & used car is 1:1 which means whenever a new car is sold a used car also comes on road. College students, first time job goers and many more choose second hand car to commute. Today we bring you the best cars you can get within the price range of 2-3 Lakhs. The Volkswagen Polo enjoyed the trust of the people ever since its launch. The company definitely enjoyed good number of sales with this one. After its update in 2014, the value of the original version started to fall, but still the older version is rocking the market & benefit from good demand when compared to supply of old Polo. The said car has been the best seller in its segment for a long period of time despite of a number of competitions. It offers a comfortable ride, up to date infotainment, customer satisfaction and the looks that never fade away. The car has been considered as the little warrior in the Hyundai camp, with an all new engine it put out five extra horses from the 988 cc block. The Eon tops the charts in its category when it comes to plastic quality and overall fit and finish level by being a notch better than that of the Alto K10. But cabin space on the Eon is still at a premium – you can just about squeeze in three at the back. 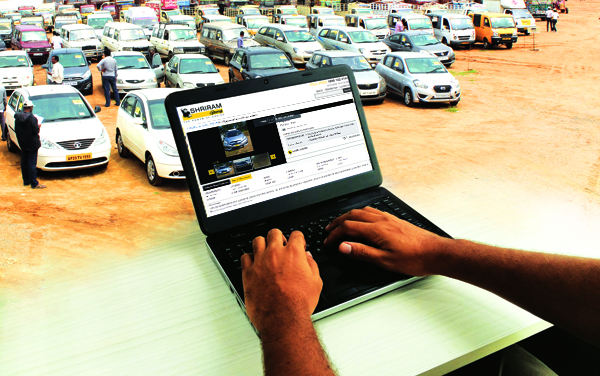 Planning to dispose off your pre-owned car online? In this age of digital era, selling your pre-owned car through the local newspaper classified will take a lot of time. Newspaper Classified listings are designed to merely present inventory to shoppers and only last for a day or two. Consequently, the listings have less information to revel the car details and the interested customer has to call to make an appointment and see the vehicle. An online listing, on the other hand, is transactional and user can upload detailed information along with good photographs of the pre-owned car. Online sellers have the potential of reaching a larger market than local classifieds. · What are the common issues for this particular car? Have they been addressed? · How large is the displacement of the engine? On average, how many miles per liter does the car return combined? · What is the average selling price for a car in this condition? There are innumerable information hubs available from where you can easily learn about your car and other related information or you can just hire a mechanic. One of the first things that buyers notice is the condition of the car. Detailing a car is an art, but it need not be an expensive one. You'd likely be fine giving the car a cheap hand wash locally, but detailing allows you to virtually polish money into the finish of the car. Pictures speak a thousand words and even before looking at the information what a buyer is interested in is looking at the cars photos. Make sure to take as many high-resolution pictures as possible. Modern point-and-shoot cameras have great dynamic range and amazing quality. Don’t use your mobile phones to take pictures with cell phone cameras, as their lenses leave a lot to be desired, and have a tendency of compressing images and decreasing quality. Always include your contact details, preferably your mobile number after uploading a classified as it will give buyers a point of contact for more information. It's insanely frustrating to see a good deal, but the seller only has email as a viable means of contact. If you own a good car which is desirable, you will definitely get a lot of buyers and most of these buyers will ask a good discount. Don’t get bullied by these buyers, keep in your mind the price you wish to sell you car. It's important that you choose a price that's realistic, based on market value. If your price is negotiable, inflate it by 10 percent, with a "Best Offer" option. That way the buyer feels like they saved some money and the seller gets the most that they can for their car. Looking to dispose your pre-owned car online but confused which portal to try? Connect with Shriram Automall India Limited and access to their online bidding platform, from where you can easily dispose your used cars and SUV’s. Online Car Bidding is a unique feature that is available with SAMIL and attracts customers due to the transparent approach acquired by SAMIL. You can also acquire used commercial vehicles and equipment from SAMIL’s physical bidding platform.